The Braves may be the worst situational hitting team in baseball by the All-Star break unless something good happens. We stand one point above Pittsburgh at .225 with RISP average. If we continue to struggle in that category I have no doubt we'll be the dead last in a couple of weeks. Has a dead last RISP team made the playoffs recently? Let's find out! The Cubs didn't in 2012. The Giants didn't in 2011. The Mariners didn't in 2010 or 2009. The Reds didn't in 2008. The White Sox didn't in 2007. The Rays didn't in 2006. The Dbacks didn't in 2005. The Brewers didn't in 2004. The Tigers didn't in 2003. NOPE! Nobody in a decade has finished dead last in RISP hitting and ever made the playoffs. People will tell you not to worry. They will tell you to just look at the standings. They will tell you that everything will be fine, that it's June, and that we will just have to let this thing play out. They are living with their heads in the sand. I don't ever advocate panic, but I do think that ignoring statistics midway through the season is a fool's play. We absolutely should be concerned about this team not hitting. A team that can't hit with RISP is a team that can't win in September and October when the games mean the most against the best pitching. That became evident yesterday against the Royals, when the Braves put 2 men on 2nd and 3rd with nobody out, and they fail to score a run. Or when the Braves had a runner on 2nd with one out in the 5th, and failed to even get him to 3rd. Or hitting into an inning killing double play in the 10th with one out and 2 men on base. These things all led to the Braves losing that game yesterday, and they are just a small sample of a long series of RISP failures. What's keeping us together as a team? The pitching. While the RISP hitting is a dank cave, the pitching has been the roaring fire at the entrance. If the Braves didn't simply have one of the top 3 pitching staffs in baseball, this team wouldn't be over .500. For the most part, they've kept scores reasonable so the Braves can have some comeback wins. The bullpen has done a great job of holding onto leads late in the game as well. Right now Atlanta has the 2nd best ERA in the MLB. It's been pitching and homers. You can look to the Pirates ahead of the Braves as an almost mirror image of the Braves successes and failures. Both teams find themselves several games above .500, both teams have major issues with RISP, both teams are best in the league in pitching. The question for both teams right now is how that will hold up over dog days of summer? So, the Braves come back after another losing road trip. After winning 7 road games in a row to open the season, they have since gone 13-23 away from Turner Field. Every time we head on the road, I think fans start to wring their hands. I think I'm as guilty of it as anyone, but even in the wins I've been noting our RISP numbers with a frown. I think it comes from simply having too many holes in the lineup right now. BJ, Simmons, Uggla, and Justin have been great places to go for strikeouts to get pitchers out of trouble with men on base. You can't work around everybody, but when half the lineup can get punched out or popped up? It's hard to get good movement of runners. The day off will do everyone some good. We're still 5 games up in the standings, but we have another division leader coming into town on Friday. I want to make sure we show them a rough time, and give Chipper Jones his due in the process. Retirement ceremony tomorrow, along with the series weekend preview. That didn't really go the way I thought it would go. The Braves gave up the early lead, and then started hitting with RISP shockingly. After that they gave the lead back, and I thought we were in trouble. Then, Jason Heyward went deep to regain the lead, and I thought we had it in the bag. Then, Craig Kimbrel had to put runners at 1st and 3rd with no outs, and I thought we were toast. 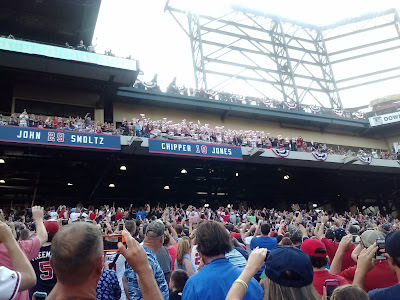 So many rollercoaster emotions on that 4-3 Braves win, but it was a win at the end of the day. Heyward's late inning homer did more than just lift the Braves to a win, it gave Medlen the much needed decision in the W column that backs up his status as one of the better pitchers on the team. For too long I've heard talk that Medlen, one of the best ERA guys on the Braves, should be sent to the pen when Beachy comes back because "he's done it before." That argument is not only flawed, it's also a lie. People wanted him sent to the pen because he wasn't winning. Now that Medlen is starting to rack up the W's I think they'll have a harder time pushing him out the door on a hypothetical basis. Note, I don't believe it would ever happen because the Braves aren't that stupid, but it at least stops me having to hear about it from myopic fans on the radio and forums. Who likes hitting? Granted 3-12 with RISP isn't an outstanding number, but with what we've normally had, I'll take it at this point. We're still falling woefully short of our opportunities at times, but the team as a whole has rallied in the latter half of the shortened road trip. Schafer continues his ho-hum awesomeness with a double and single including a stolen base, Heyward hit a double and the game winning homer, and everybody else in the lineup got a hit EXCEPT Brian McCann. Grand slam or not, he's still on my watch list. I like the fact he still has the power, but he's starting to worry me a bit with his lack of hits all this month. Over the last 7 days, Brian has only been 3/17 with the grand slam as his only RBIs, and he's fallen to .240 on the season. Medlen made a huge mistake in the 5th inning with 2 outs by giving up a mammoth homer to Kosmer that tied the game at 3. Other than that, he danced around trouble pretty well. 7 innings, 7 hits, 3 runs, a walk, and 5 Ks. Not a bad line if your team is hitting the ball and the bullpen holds up. Both of those came true, except for Craig making everybody nervous in the 9th. I think he's bored. Maybe he needs to put 3 men on base to really have his closer juices start flowing. Either way, he gets the job done, and the Ks were huge in that win. The CPA missed on its estimation of a Braves loss yesterday, so what does it have in store for the final game of the road trip? The CPA likes Minor on the mound in this game against a Royals pitcher that struggles with his command at home. In a high WHIP v. low WHIP game, the advantage goes to the Braves lefty, and the extra batter in the lineup can't hurt our chances with the DH. First game is going to be a complete crapshoot. I'll start with that. BJ Upton saw a bunch of Santana hitting for the Rays, other than that, we have next to no ABs against the guy. BJ hits him well, so for once maybe BJ will be giving tips out to the dugout. At the very least there's a lot of film on Santana, so the Braves should have a shot at getting some contact. Here's the problem: In June Santana has given up 3 runs in 28.2 innings. That's an ERA of 0.94. Let that soak in. Mmmhmm. It's that ridiculous. Oh and here's the kicker, the Royals are 2-2 on the month in his starts. They actually lost 2 games with a starter that averages 7 innings and an ERA less than 1. How is that possible? The bullpen let him down big time in the 8th and 9th. So if the Braves hang around for the late innings as they are wont to do, there's a shot of knocking a ball out of the park. On Medlen's side you have another guy who's been getting almost no support, and a June ERA of 1.69. This has pitcher's duel written all over it. The difference will be who gets the early runs, and who gets first blood in my mind. Game 2 is our ace Minor against their disaster Mendoza. At this point, you are all well aware how good Mike Minor has been pitching. There's no reason for me to go into it other than to say he finally lost a game in that awful series against the Mets. He finally had a bad day, and I don't expect another one for a while. He'll be ready to pitch against a Royals team looking to make contact, because they strike out the fewest times of any team in the majors. That may mean a lot of quick innings if Minor is working well. Mendoza hasn't fared well at all for the Royals this year, in fact he's been downright awful in over half of his starts. His last outing was a 5 inning, 4 run performance against Cleveland. He has a home ERA of 5.88 on the season. His WHIP is 1.45 with a terrible K/BB ratio of less than 2. For a team that's prone to strike out a lot like the Braves, that's music to our ears. How's the CPA (37-28) think Game 1 will go? I think it will have to do with the team that's better in the first few innings. The CPA doesn't like the Braves chances of striking first in this game. They may get a run somewhere late in the game, but you have one of the best ERA starters of the month facing off against a team that's really been struggling at the plate for the most part. That doesn't fare well especially since Santana has 77 Ks to 15 walks. That's ABSURD for a K/BB rate. Huge disadvantage to the Braves there as well. The only chance we have is to hit an early homer and establish a lead. Otherwise, look out. A win? Some runs? A grand slam? These are a few of my favorite things. Paul Maholm was the lucky recepient of an early 4 run lead in the game on Sunday, as well as the beneficiary of 3 more runs to seal the win in a 7-4 final. Early in the game, I thought we were going to blow a bases loaded scenario with 2 outs, but Brian McCann finally came up large after a month of languishing in a slump. 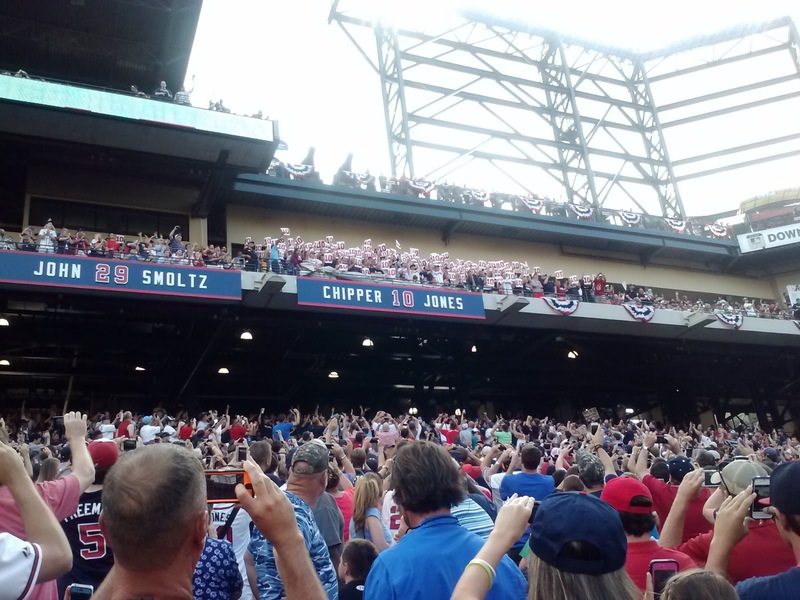 Once that happened, the floodgates were open, and the Braves could relax a little. The Braves had 14 hits, 7 runs, 4 walks, 7 Ks, and saw 173 pitches. They also went a lackluster 3-13 with RISP, made better by the two homers. Braves hit homers, Braves win. Braves score first, Braves win. Do both? It's almost impossible for the Braves to lose. I'd like to spotlight one guy who's been ripping it up, and that's Jordan Schafer. He went 4/5 yesterday with a double and a homer. In the month of June he's hitting .323 with an OBP over .400. He's been hotter than hot at the plate in the leadoff spot, and that's why Fredi is trying his best to get him into games. The wrist injury to Justin, who has been struggling, provided an easy solution to that problem. That probably won't last, but I think that as long as Jordan is getting on base, Fredi is going to try to get him in games in every series. Right now, Schafer, CJ, and Freddie are your top 3 hitters on the team. Tim Hudson had to look at the grand slam fly out of the ballpark and think, "Really? Now you do that? Now? That would have been helpful YESTERDAY!" Paul Maholm just had to go out there and throw strikes with a 4-0 early lead. He did just that, with 5 innings and only 1 walk. He did get into trouble occasionally and he did give up 4 runs in the 5th. However, at that point the game was already 6-4 and he didn't give up the lead. Was it a great performance? Absolutely not. But it was enough to get the job done with the offensive output we had that day. As the hitting goes, so does the Braves win column. It's fairly evident every game, now. Five players had multi-hit games. Every starter touched a base. That's the kind of production we need every single night in order to win. For the 2 game series we have with KC after the off-day, the Braves are going to have to put up runs. Why? The Royals this year are not the whipping boy they've been in the past. In fact, they have scored more runs on the season than any of the Braves opponents in the NL East. Speaking of those opponents, the Braves only dropped a single game in the standings with all their losing, so it's a 6 games lead now on the Nats. Washington has a tough 2 gamer with Arizona before we face against the Dbacks in the weekend series. That should be an interesting one to watch. Enjoy the off-day from baseball. Use the time to check up on Wimbledon, or the College World Series, or whatever happens to be on your DVR. Then, on Tuesday, we're back to regularly scheduled baseball. Didn't I just watch this game? Another 2-0 loss by the Braves where they couldn't hit a lick? Seems like these terrible games are starting to run together like a red shirt in a load of washing whites. Our bad hitting is tainting everything, and costing us wins. Hudson pitched great, just like Teheran before him. That didn't matter, because the Braves couldn't plate a run. In fact, they haven't plated a run now for over 24 innings. That's right, you have to go back to the 3rd inning of the Thursday game against the Mets to find a time when the Braves scored. I said at the beginning of this series that I just wanted a single win. I'm sure many people rolled their eyes at that and thought I was just being dramatic. I was not. We are so bad when facing new pitchers, that I seriously wonder if this team may not score a run in this entire series. Bear in mind, this Milwaukee team was dead last in their division when this started, behind the Cubs. The Braves got 4 hits. Simmons had 2, and BJ had 2. It's almost ironic that BJ has started heating up just while the rest of the team has gone completely into the tank. Heyward, Freeman, McCann, and CJ didn't touch a base. Those are supposedly 4 of your best hitters, all getting blanked. As one of my buddies discussed with me yesterday, it's like they are going up to the plate with absolutely no plan. It's just swinging away at every breaking ball that comes their way, and not working counts to get into a position to see a hitter's pitch. That's a good point, because if you look at the pitches seen by each hitter, you see an alarming trend. Heyward saw 11 pitches in 4 ABs, McCann saw only 11 in 3 ABs, and CJ saw 9 in 3 ABs. Seeing an average of 3 pitches isn't going to do the job. However, even though Freddie didn't get a hit, he saw 20 pitches in 4 ABs. An average of 5 means he got to full counts a few times, and saw enough pitches to at least barrel up a few balls with only one K. Freddie always has a plan. I'm not sure the rest of our hitters do. Even Simmons, who got 2 hits, only saw 13 pitches in his 4 ABs. That can turn on you quickly if you're not careful. Our pitchers must want to turn over a watercooler in the clubhouse. We have a top 5 pitching staff in the game, and we're losing over and over to a league leading amount of shutouts. I won't belabor the point much, but we're pitching well. Everyone who watches the games can see that. We're just not hitting the ball. Everything that is wrong right now with the Braves is offensive (small pun). So, for the time being, we as fans can focus all of our energy on doing what we can do change our luck. That means lucky hats, shirts, sandals, underwear, socks, whatever you have in your place. Put those on today for the 2PM game. I'm going to do my part by putting on a Hawaiian shirt, pulling out the dueling tomahawks of red and white, and putting on my straw hat in the house. Don't ask me why that seems to work well. The CPA is predicting a shutout. The CPA has never accurately reported a team getting shut out. In fact, in many cases, when the CPA guessed a team would get shut out, that team went on to win the game with a lot of runs. So, we'll see what happens. It's another game where you have a young pitcher the Braves have never seen, against our vet starter who has a terrible road ERA. Let's see what happens. Maybe a little luck will be on our side. If you like hits, you were sorely disappointed. The Braves only had two of them, and they lost the game 2-0. It's the same old story. Starter gets in early trouble, gives up 1 or 2 runs, Braves get no hit for half the game, and nobody can rally late. With 6 walks, the Braves had ample chances to get something going, but they could never put good wood on the ball. As a result they only went 1-8 with RISP, and that 1 didn't score a run. CJ continues to be a standout on the team with his hitting, and Freddie couldn't get anything going this time. BJ had the other hit, and it looks like he's seeing the ball a lot better in his last 10 games than anything we saw in the first two months. In fact, he's hitting near .260 over the last week with 2 homers and 2 doubles, along with 5 RBIs. BJ Upton, and here's the really depressing part about the state of the Braves, has provided nearly 25% of the Braves RBIs this week. CJ and Freeman have put up almost half. The rest of the team filled in the nearly 30% gap. That's a lot of non-production from regular starters. Simmons has none, Uggla has none, and McCann has none. Brian has frankly been awful, even though nobody wants to discuss it. He's hitting .176 on the week with almost a third of his ABs as Ks, and he's scored only a single run. So with all the slumping, isn't it time we took a look at what a hot lineup would look like? I think it is, because Fredi has to be pulling his hair out. Here's what the perfect lineup looks like right now. SS - Simmons stays in short for defense, but bats last because he's become a liability with his OBP. That's how your lineup would looks. BJ, Mac, and Uggla would be sitting right now. BJ would probably get platooned with Schafer because he's been hitting over .230 in June, meaning it's coming around, but McCann is below the Mendoza line in June with a .188 average, and Dan Uggla is hitting .128 with RISP on the season. You can't keep putting him out there. At some point, we're going to have to cut our losses with Dan, because we're bleeding games in the standings before the All-Star break. I think that Fredi will give this "new contacts" excuse/solution until the All-Star break, but if he's not better? Pastornicky or a healthy Pena will take his job. I also have to take the chance to update the series preview. The Brewers have learned something I've already illuminated to you readers. The Braves are awful against pitchers they've never faced before. Like, potentially no-hit awful. As a result, the Brewers moved out Gorzelanny, a guy the Braves had a multitude of ABs against, and put in Donavan Hand, a guy who's never tossed a single pitch against Atlanta. You know what that means? It means we're in big trouble. The CPA will fill in the gaps. Until Fredi changes the lineup, or the Braves prove they can hit without having film on a guy, the CPA will never predict them in a winning situation against a new starter. Hand will be making his first ever career start with a career ERA of 3.38, and Huddy will be facing a Brewers lineup he pretty much controls. I expect the Braves not to have a hit until the 4th inning. Tim has also struggled in the first two innings, so the Brewers could jump out to a quick lead. Overall, the numbers are bad. Somebody needs to be a hero in the lineup and hit one out when people are on base. That seems to be the only way the Braves win these games. Normally when a player has a bobblehead night, they play well. BJ must not have received that memo, since he went 0-5 with 2 Ks, and he grounded into a double play. It might have gone better if he'd just been tossed early in the game for arguing balls and strikes. Then we'd have a pinch hitter in the game who could actually hit. The Braves had no reason to lose this game, except for the holes in their lineup. Somehow, with 13 hits, they couldn't push across more than 3 runs. I'm not even sure how you pull that off in a 9 inning game, but it happened. 5 guys (Pastornicky, Heyward, Freeman, Justin, and Laird) had multi-hit games. CJ had a single hit. Simmons and BJ came up snake-eyes. That added up to a 3-13 night with RISP, 0-4 from BJ and Simmons, 11 runners stranded. Chris Johnson had 3 errors in a single game, and 2 on the same play. On a team which is supposed to be about pitching and defense with bang or bust hitting, the defense has been the most suspect. The Braves are now 20th in fielding the majors, 9th in the NL, and we are the worst fielding team that's leading a division. That has to improve, because we're making too many mind-numbingly-stupid errors. The Mets beat us in a 5 game series because we couldn't hit runners in, we committed an astonishing 7 errors, and we got outpitched in a double header. In a series where you expect to move up in the standings, the Braves lost ground. The worst part is that now they go on the road, where they are notoriously bad at hitting the ball, and to a park where they are 0-6 in the last 2 years. Dan Uggla supposedly has vision problems. They apparently knew about this in spring training and did nothing about it. I guess sitting below the Mendoza line heading into July finally got somebody's rear in gear. Now Dan is getting his astigmatism checked out, and may or may not have new contacts for the series in Milwaukee. Part of me hopes it really makes a difference, part of me thinks that if it does make a difference I'll be pissed off he didn't try it sooner, and another part of me thinks he's so hopeless that they could replace his eyeballs with Ted Williams' and he'd still swing at pitches in the dirt. Minor wasn't sharp in Game 5, and that was another problem. If you give up 3 homers in one game, the chances of a win spiral down into Hades. Mike gave up 9 hits, 4 runs, 6 Ks, and 2 walks. The bullpen came in for 3 innings and gave up nothing between Walden and Avilan. The Mets pitching staff started with Niese, who gave up 3 runs on 8 hits in 3.1 innings, but then the Mets bullpen came into the game after Niese got injured. The Mets bullpen had an ERA over 4.50 when they were forced to pitch 5+ innings against the Braves. Somehow it only gave up 5 hits and no runs. If you could see my confusion when typing out some of these stats, imagine a Labrador trying to do integral calculus. These are impossible numbers. Stupefying abnormalities. Frankly, that's Braves baseball this season, and it threatens to send us all screaming to the men in white coats. Braves play in Milwaukee tonight. Series preview next. We lost both. The bats couldn't have looked worse, and we went 0-12 in the second game with RISP. Honestly, I don't even want to think about these games because we were facing guys the majority of the lineup had never seen, and it was coming off probably one of the most tiring days we're likely to have all year. Anything I try to analyze about these matchups will never hold true in a normal setting that doesn't include rain, and playing 3 games in 24 hours. The Mets had a better plan than we did, and that was to just see ball, hit ball. They had 21 hits in 2 games. We had 13 hits. That was the difference. The pitching wasn't good, but then again how could it be? Maholm did fine allowing only 2 runs, but then the bullpen botched that up. If yesterday was the worst day of the season, I'll take it right now. Somehow we're still in position of 7 games up in the standings because the rest of the division is a floating joke. I can't tell if that will last all season, but if you're the Nats or Phils, it has to be demoralizing to watch the Braves lose 2 in a row, and still realize you don't even have winning record yet. Nobody does in the division except for the Braves. We are literally the only division in baseball that has a single team at .500 or better in the entire set of teams. If we don't win this division the way things are going this year, it's a joke. The Braves are in the almost identical division position that the Falcons found themselves in the NFL last season. After all is said and done, those games don't matter. Other than being tired from watching that much baseball in a row, nothing has really changed. The Braves can go out tonight and win if they get some hits. That's the only thing holding them back right now, and that ebbs and flows. Sean Marcum has been terrible against everyone except the Braves, so you hope that the lineup decides to make contact today. If they do that, they can win. If they strike out 12 times again, they will lose. Simple as that. The CPA (34-26) lost both games of the doubleheader, which sets up for today's prediction with Medlen on the mound. The CPA doesn't think the Braves will get to Marcum. It thinks they will get to the pen. It expects another game where the Braves don't hit for 6 innings, followed by a flurry of offense against the Mets relief core where they edge it out. The most concerning thing is the strikeouts by Marcum. If he really settles in, the Braves are in big trouble. Where would we be without Freddie Freeman? Well, we'd be a few less in the win column, that's for sure. Last night, the Braves did absolutely nothing for 8 innings offensively in a game that was delayed almost 4 hours by rainy weather. It was looking dim in the 9th inning when the Braves were down to their last 2 outs. A sharp grounder by Justin put a man on base and brought the winning run to the plate in the form of Freddie. As the stalwart crowd chanted "Freddie, Freddie, Freddie!" the powerful lefty looked at a 2-2 pitch as the Mets catcher set up inside. Immediately, in my heart, I knew that Gee had already made a mistake. He went inside on Freddie with the game on the line, and Freeman golfed one over the fence into right field to win the game 2-1 for the Braves. The stat line for our hitters was atrocious. The Braves only had 5 hits, 3 of which were Freeman's. Justin had one in the 9th to set up the win. That means only one other Brave had a hit from innings 1-8, and that was Heyward. Everyone else got shut out. Only CJ got a walk. The rest were just flailing away in futility as the raindrops continued to fall. 0-4 with RISP, and no extra base hits by anybody except Freeman, who was a triple short of the cycle. This was Freddie's game, and we were all just witnessing it. Hudson got absolutely screwed again. He pitched a 1 run gem of a game, going 7 innings, 6 hits, 3 walks, and 6 Ks. What did he get for his performance? Nary a run of support. Instead, he was taken off the hook for a loss by Freddie, and David Carpenter swooped in for the win. I know it has to be frustrating for Tim, but he's pitching like the Ace we know he can be. The problem is that game was so late, and the hitters were in such a hurry due to the oncoming double header today, that nobody was going to wait around to see a bunch of pitches. It was hack and go, and Tim got unlucky that the one run he gave up was to the pitcher on a 2 out rally. What matters though is that Braves won, and we suddenly find ourselves back to 7.5 games up in the standings over the Nats, who had the courtesy to blow a game last night to the Phillys. Who would have thought after that wretched road haul? The Braves look like a wire-to-wire team the way the rest of the division is playing right now. Atlanta just has to keep up their end of the bargain by beating up on the bad teams like the Mets. Feast or famine means you can't skip a good meal. The CPA (34-24) got lucky by predicting a big win, but it settled for a rain soaked comeback. Now we head into a weird territory. It's going to have to predict both games of the double-header, since there isn't time to do a recap in between. Let's see what it thinks. The CPA likes the Braves in the first game in a squeaker. The second game should favor the Braves more with a young pitcher making his major league debut. By numbers, that means the Braves should rough up young Wheeler. In practice? The Braves have had issues doing that. However, with Maholm on the mound at home, that later game should be lower scoring with his 1.64 ERA in Turner Field. Can the Braves win 3 games in 1 day? The CPA thinks yes. You're reading that right. We have 5 games against the Mets in a row. What was supposed to be a 4 game set became 5 due to a rainout earlier in the year. Hudson needs to get a little offensive love in the first game, since he's been on the receiving end of a grand total of 2 runs in his last 2 starts, and he's only given up 4 runs in his last 3 games. He's pitching much better than anything we saw in May, which is a good thing. He faces Dillon Gee, who is about the only thing besides Matt Harvey that the Mets have going for their rotation. Gee has won 3 straight, giving up only 3 runs, and he won 4 of his last 5 starts. Guess who was the lone loss? The Braves! In fact, he gave up 5 runs to the Braves lineup in a 6-0 loss in NY the last time he faced us. The Braves have really capitalized on Gee in the past with Heyward, Justin, CJ, and Simmons all having OPS numbers over .970. However, Uggla, Mac, and Freeman all have batting averages against Gee under the Mendoza line. It's haves and have-nots in the matchup, and you hope the haves go deep. Matt Harvey has fallen on hard times since his blistering start. He's lost 4 of his last 5 starts. He's getting no support from the Mets lineup, which has led to many of those losses. The last two games he's received 2 runs, similar to the drought problems of Tim Hudson. Harvey hasn't faced most of the lineup as a starter before, which usually means terrible things for our hitters. We'll see if things turn out any different in this go-around. Also, those of you expecting to see Beachy get a start? Well, he's been sidelined with elbow tenderness. The MRI showed no structural problems, just fluid buildup. That means he won't be making a start in the big-leagues anytime soon. If I'm the Braves front office, he won't be making any starts this year. I see absolutely no reason to rush him back, and this elbow issue proves he's not ready. In his place, the Braves will give Alex Wood his first start ever in the majors. This kid went from AA to the bullpen to starting a game in a matter of weeks. This has to be a whirlwind for him and his family. Hopefully he can settle down long enough to get some good innings. However, this is a completely mismatch waiting to happen. I wouldn't be shocked if the Braves put in the entire B-squad for this game. Maholm couldn't have looked worse in his last outing against SD. The whole team couldn't for that matter. It was a problem that we can all just forget and gloss over, because that was a road game. Paul in home games has an ERA of 1.64 on the year. He's been filthy in Turner Field, and his win-loss record has been elevated because of that. The Mets are throwing Zack Wheeler at the Braves, a pitcher that has never tossed a single ball in major league play. My gut says, uh-oh. Again we're slated to see a guy who we have no film on and no idea what he throws. It's see ball, hit ball, and several of our hitters don't really do that well. The exceptions are Freeman, Mac, Gattis, and CJ. You have to hope they are all in the lineup. Game 4 puts Medlen back on the hill coming off a blasting by the Giants that I witnessed first hand. He's better than that, so I'm not really going to hold it against him. That, and he has held the Mets lineup to a .198 batting average, so I'm predicting good things for him. He goes against Shaun Marcum, a guy that is about THIS close to getting sent down to AAA for his issues. He's lost every decision he's had, but here's the no-so-funny thing. The Mets have only won two of his starts, BOTH against the Braves this year. That has to stop. I have no idea why the Braves have given away games late against the Mets when Marcum pitched, but a lot of it has to do with the fact that our normally solid hitters can't seem to make contact off the guy. He's racked up 46 Ks in 126 ABs against the Braves. That's an absurd number, and if they don't make contact against Marcum, he'll end up beating us again. The final game, and by this point we'll either be loving this series or absolutely hating it, is Minor against Niese. Minor can't seem to be beaten as he's led the Braves to 8 straight wins. Niese is going the other direction, having lost 8 of his last 10. Minor's WHIP is one of the best in baseball at 0.97, and Niese's is at 1.57 on the year. Minor has a home ERA of 2.98, and Niese has a road ERA of 6.45. If this game were played on paper, there's no way the Braves would lose. The Braves hold a .309 average against Niese lifetime, and they hope to continue the hot hitting against him in the last match. The CPA (33-24) finally got off the shnide and predicted a Braves win the rubber game of the Giants series. Now it looks to game 1 of the Mets, and a tough matchup that may or may not be affected by some weather. If you're the Braves, you want to pitch fast, and you want to have a lead, because the rain may show up again around 9PM. The Mets have had major problems scoring runs of late, and even more problems hitting Tim Hudson on the road. The Braves have been scoring more in the last two games than they scored in the previous 3 combined. The Atlanta hitters are trending in the right direction on the week, especially Justin, Heyward, and CJ. Considering they are the ones who have been hottest against Gee, the CPA expects them to capitalize. The Braves put together a dominating pitching performance in Game 3, led by Julio Teheran's 6 innings of shutout ball with 8 Ks and one walk. The ridiculous part was the Giants had 7 hits, but the Braves were able to dance around the damage with a combination of good luck and ground balls. Then to make matters worse for the Giants hitters, the Brave bullpen didn't allow a single baserunner for the next 3 innings. They went into complete shutdown mode. Craig Kimbrel came into the game in the 9th and made the Giants hitters look silly. It almost wasn't fair. 1-2-3, go sit down. Braves win. Was the Braves hitting any good? Meh, it was good enough, and with a shutout by your pitching staff, that's not a big hurdle. The Braves went 2-10 with RISP, stranding runners everywhere. Freddie Freeman continues to be one of the reasons the Braves are even competitive. His 3/4 day with a 2-out RBI gave the Braves the early 1 run lead. CJ also continues to be an unsung hero with his good hitting at the back end of the lineup, with 2 hits on the day. That was 5 of the Braves 7 total hits. The rest of the lineup got one base with walks or singles, but there were no big homers for the Braves in this game. Tim Lincecum wasn't sharp and he was walking people constantly. He gave up 6 hits and 5 walks. You can pitch around the hits, but it's almost impossible to defend that many walks. The Braves took the series by taking game 3, and if you were watching the ESPN broadcast, you'd be shocked the Braves could do anything at all. They continue to play to their audience, which is primarily pushing the coastal fans, and in the meantime they seem to talk a lot about the deficiencies in Heyward's swing, the problems that Lincecum has been having, and how good Buster Posey is playing. I don't have a problem with pointing these things out, but outside of Kimbrel, you don't usually hear them give a lot of credit to the Braves lineup. I do have a problem with how negative they seemed to be on a lot of different topics, on both sides. They did discuss Gattis and his skills before wondering if he should leave the Braves in 5 years for an AL contract. Because the AL is their money maker, remember? If it's not Boston of NYC, how did it get on the air? Anyway, next up the Braves face a Mets team that made the airwaves this week for one of the worse defensive plays you're likely to see all season. That's no reason to believe they can't bring that kind of ineptitude down to Turner Field for a few games. In fact, I'm hoping they do. Heck of a comeback last night. The Braves finally opened up their offensive playbook a little and they got the benefit of some questionable fielding by the Giants. Couple that together and you get a win for Atlanta, and a salve on a 4 game wound. The difference between yesterday's game and the ones leading up to it was simple: the Braves hit the ball with RISP. Atlanta went 4-8 with RISP, had 11 hits in the game, with 4 walks, and 2 home runs. That's more good hitting than we saw in the last 4 games combined. A lot of it had to do with 2 guys I was ready to bench for the game, Justin and BJ. Bossman Jr. went for 2 long shots with 3 RBIs, and Justin had a hit and a key walk in the 9th to score the tying run. Between them, they had 4 of the 6 RBIs for the Braves. Goes to show what I know about rostering a team day to day. Fredi had the right of it by playing a hunch, but I still question going against the matchup numbers on a consistent basis. Eventually every average catches up with you. The starting pitching wasn't good. Mike Minor was struggling and didn't have his best stuff all day. However, even with a pitcher is struggling, if you can keep it within 4 runs, this Braves team has a chance. Mike did enough to keep it close after his 2-out disaster rally by the Giants in the 3rd inning, and again in the 5th inning. Mikes line of 6 inning, 5 runs, and 7 hits is one he's going to want to forget. The important number, however, is 8. That's how many starts in a row the Braves have won with Minor on the mound. Can he be this year's Medlen in terms of the good luck charm? I'd like to hope so, because he deserves it with his good work. The bullpen, which seems to still be on people's short list of problems for some reason, was great. They put up 3 innings of scoreless work, keeping the game close enough for the Braves to have a shot in the 9th. Just so people can get off the bullpen's back a little, they are #1 in the NL in ERA right now with a 2.81 with the next closest team 17 points back. So, relax a little. They had some issues with injuries but they are pulling it together with gusto. One of the great things about this game was that everyone contributed everybody 1-8 touched a bag, which is completely different from the slump where only half our lineup was getting on base. Simmons had probably his worst game of the year with 2 errors, and an 0-5 batting line where he only made it on base by virtue of an error. He's still dealing with problems at the plate, and I think he's one of the guys I really wish would work counts better in the leadoff spot. I'm going to continue to harp on this, because it's his job to take pitches even when he's not hitting well. He's got to be a tough out, not a hacker. Case in point, Schafer comes in for a PH situation with only a single AB, and he got a hit before Simmons grounded into a double play on the second pitch. At some point, Greg Walker needs to get him to stop that, or he's not going to be in the leadoff position for very long. The CPA missed again (it's in a slump as well), and it's looking to see if the Braves can win the rubber match on ESPN tonight. The CPA likes the Braves in this game due to the fact that the previous Giants hitters that gave him trouble in SF are on the DL. Also, the Braves have hit Lincecum well at home, even though they struggled hard against him on the road. It should be a fun matchup today. I have no idea what in the world I watched yesterday. I expected a team to actually show up at Turner Field. I was sadly mistaken. The Braves are mired in a terrible slump right now at the plate, and it's like an infection in the bloodstream. Everything that infection touches is slowly dying. Pitching, defense, and hitting have all withered away into a display that would embarrass a AAA team. The game started with a lead-off homer by the Giants. At the point, you literally could have turned off the TV, flipped off the radio, or got back in your car, because the game was over. I'm not joking, that one run was all the Giants needed to win, and it happened on the very first batter of the game. At one point, the crowd was excited because the Braves broke up a no-hitter by Bumgarner in the 6th. And it was in doubt that we would ever get a hit at that point. CJ broke it up with a high flying single that dropped in right center. The Braves could only manage a combined 3 hits yesterday, by Freeman, Simmons, and CJ. Right now, 8 players in the Braves lineup are hitting below .250 on the week. The only guys who aren't? Dan Uggla, Jason Heyward, Freddie Freeman, and Andrelton Simmons. Going into the game today, as I said in the preview, there's no way we should be playing Justin or BJ who are batting a combined <.100 off Gaudin. Brian McCann needs a day off because he's been awful over the last 7 days, batting .133 with no extra base hits, and 7 Ks. But what is Fredi going to do? He's going to run them all back out there today, regardless of what's going on. Maybe things will change today, but I think we're starting to verge on the definition of insanity if we let this go on much longer. We're trying the same thing over and over and expecting different results. The pitching has fallen apart with the hitting. That's a mental thing I think. We're verging back into the territory of the pitcher believing he has to be perfect because he knows he's not getting support any time soon. That means you have guys working corners, giving up more walks, and trying to do too much with breaking pitches. The problem with that strategy is that the more breaking stuff you throw, the more likely you are to hang one by accident. Hanging breaking pitches leave the park. Kris fell into that trap with the homer in the first inning, and then the bleeding started. He wasn't locating, he wasn't getting the calls on the corners, and the Giants weren't missing. Add in the fact our defense misplayed several balls, and you get some very big losses. Medlen went 6 innings, but gave up an astonishing 9 hits, and 4 runs. The CPA was wrong again because the Braves couldn't score. I have a feeling it's not going to like this matchup since Fredi is ignoring the Upton's struggles. The CPA doesn't believe the Braves can hit right now. Until that turns around, and our weekly numbers pick back up, the Braves are at a disadvantage in most matchups. You have two good arms on the mound today, which could mean a lower scoring game, but the Giants have been swinging really hot over their last 3 games, meaning the momentum is with them. Minor will have to turn that tide by keeping the Giants off the basepaths while hoping the Braves can put a run in the board in the first four innings. This series was a complete disaster. The Brave were swept for the first time in the NL by the Padres. If we got cash for clunkers, this series could put a down payment on a Ferrari. In fact, what do you think Chipper Jones? Exactly. We're hitting balls hard, but they are going right into gloves. For the most part the Braves are pitching well (Maholm was the exception), and we're not getting the run support. Maholm went 5.2 innings with 5 runs, 7 hits, and 3 walks. I expected some baserunners, but that's ridiculous. Meanwhile, Volquez looked like a completely different pitcher going 7 innings with only 1 run. The guy came into the game with an ERA near 6, and he shut us down cold. I am not amused. The hitting? Situational hitting (or lack thereof) is killing us. The Braves go 2-9 with RISP, stranding 9. The Braves went 4-22 (.182) with RISP on the series. They can't string anything together on the road right now. The problems that concerned me at home with the Braves carried over to the road. Even against the Pirates the Braves struggled with RISP, but they were bailing themselves out with the long ball. Now on the road, the long ball wasn't a big portion of the offense, and the RISP numbers reared their head. Also, Freddie was robbed several times on possible hits that got snagged by Padres infielders. The Braves scored 2 runs in this series in the first 4 innings. The Braves now average 1.8 runs per game in the first 4 innings, 21st in baseball. They also give up 1.92 runs to the opponent in the first 4 innings. We have the worst run differential in the first 4 innings than any other team leading their division. These slow starts are what really cause the issues on the road. When you are at home, you get to bat last and rallies are more likely. On the road? Everything is against you. It's tough to win on the road anyway, and it's even tougher when you're always playing from behind. We get a merciful day off before heading home to face the Giants. Lucky for us, the Giants have fallen on hard times of late. They are only 2 games over .500 and they've lost 2 in a row, and 6 of their last 10. Sandoval aka Kung Fu Panda is on the DL, and it looks like Scutaro will be heading there shortly. We're catching them at the right time, and we need to take advantage. This home series will be about righting the ship after a day away from baseball. Do we hate scoring early that much? It's a late game, Braves. I could use some early runs to let me know if you're going to make the effort. Scoring in the 8th and 9th isn't a good strategy for success, and it didn't work here either. They made it close at 7-6, but fell short because the hole was just to deep. Teheran looked like crap all game, and the stats line showed it. 6 IP, 5 runs, 2 homers. That's never going to cut it for a Braves offense if they don't have 5 runs themselves in the first 4 innings. Add in the fact that the Braves didn't score the first run until the 5th, and you have a game that was 7-1 when I declared it impossible to win. Despite the rally, that was still true. At least Gattis got his 4th pinch hit bomb. He's ridiculous. All-Star team, if you asked me. Once again RISP has been a total disaster on the road. 1-7 with RISP means we lost. I don't care that we had more homers in this game, it isn't going to be enough to dig yourself out of a 7 run hole. Both Uptons, Jason, and Gattis had a great game, combining for 7 hits, 5 RBIs, and 3 homers. The rest of the lineup was not great. We're forcing Simmons into the leadoff spot, but he still doesn't know how to work counts for walks, and he's still swinging at way too many bad first pitches. He went 0-5 as a result, and his OBP is only .288 on the year. That's 14th on the team in OBP. Why is he our leadoff guy? I think it's a terrible place for him to be hitting, honestly. Even Chris Johnson would be a better choice at .357 OBP since he's the everyday guy now. Before you say, but what about the stolen bases? Simmons only has 2 of those. Relax. It's not a big enough deal to keep him in that slot for speed. Guess who has 7 stolen bags? Schafer. Guess who has the best OBP on the team? Schafer. Guess who's not an everyday player? Schafer. The mind boggles. Gearrin came out there and stunk the joint up again. When he's good, he's great. But when he's bad, he's a greasefire. He went for 2 innings and 2 runs in relief. That turned out to be the difference since the Braves rallied to 6 runs. I want fans to note the importance of that. Keeping a game close in the late innings is extremely important for a team with power. If you're within 4 runs, the game is never over. If you get outside of that range late, it's an almost certainty that you will lose. That's why starters controlling the bleeding, and relievers keeping the score static are so key. We failed on both counts last night, and it cost a chance at a win. Certain players have been heating up in June. Uggla is now batting .348 on the week, but that won't last so I'm not going to get excited about it. I plan on staying on his case all season if that's what it takes. I will get excited about Heyward batting .414 on the week. He's trending in the right direction after his injury layoff, and I think his swing looks better and better as the games go on. BJ is hitting .278 on the week, which moves the meter slightly out of the .150s on the season. Also, congrats to Heyward for getting over the Mendoza line! WOOOOO! Break out your party hats. Dan Uggla's at .195 now. Will he get there too? What will we do with ourselves if that happens? The CPA (31-21) was dead wrong about run support yesterday since Marquis got it all, and Teheran got jack. Several people in the Padres lineup have success off Tim, and he's only one game into a road turnaround. That doesn't impress the numbers robot. Recent successes are are issue for a Braves team that has almost no experience against a guy like Cashner. If you've learned anything from our hitting woes, you know that the first time our batters usually see a guy, we hit terribly. This one could go the Padres way unless the Braves finally get some early runs for Tim (which they haven't in a while). The Padres are a mediocre baseball team. They are 5-5 in their last 10, 29-34 on the season, and 16-14 at home. Nothing they do is special. They are middle of the MLB in runs, middle in average, slightly below average in ERA, and slightly above average in fielding. They are the blah ice cream you see in the grocery store that comes in the generic cartons that just say "Vanilla" on it. That being said, even vanilla has its days. On to the matchups. So you can see from the starting pitchers that we're getting a lot of matchups between people with decision success. Why the are the Padres below .500? Glad you asked. The answer is that their starters have a combined 5+ ERA. You don't really want to get into the SD bullpen, you want to rough up the starting pitchers early. That's not exactly a successful plan for the Braves on the road, since early runs have been tough to come by. However, with Teheran on the mound, he's been the recipient of some of the highest run support on the team (along with Minor). He'll need it against Marquis, a guy that actually pitched for Atlanta back in 2000-2003. Marquis' home ERA is 3.89 with a WHIP over 1.40, but he's averaged more than 5 runs of support every start for his last 5 games. Teheran hasn't been getting those kinds of numbers in his last 5 from the offense, averaging just under 3 per game, after averaging near 6 per game in his first 5. Luckily, Teheran has been ratcheting down his ERA from 5+ to 3.30 on the season currently. This is a battle of who gets the support in my mind, and the Braves have ample experience against Marquis, while the Padres have never seen Julio. Advantage Julio, and advantage Braves. Hudson could use a win. He got absolutely screwed in his last outing by the Braves bats getting shut out. Now, he's looking to rebound against a team he owns in his career. In his last 5 matchups with the Padres, Hudson has a 3-0 record and a 0.87 ERA. He's been red hot. Meanwhile, Andrew Cashner for the Padres has been moved into the starting role this season after SD struggled with some early pitching issues. He's never been a true starter until this season. He's been decent, but he's also given up at least 3 earned runs in each of his last 5 starts. He's faced the Braves for a grand total of 0.1 inning in the last 3 years, and he gave up a hit, 2 walks, and 3 runs. That's an ERA of 81.00 for you keeping track. Will we score 81 runs in this game? Unlikely, but we certainly hold a historical advantage with Huddy on the hill. Maholm is red hot right now. Despite not getting the needed runs in LA, Maholm hasn't lost a decision since May 11th. He's averaging only 2 earned runs in his last 5 starts. Historically, he keeps the SD lineup in the ballpark, with only 2 homers in 84 ABs. That could be large, considering that a lot of his earned run damage lately is coming off the bomb. The Braves look at a guy like Volquez, who used to be a fixture with the Cincinnati Reds, as a guy to feast on. He had 1 start against the Braves in 2012, and they ripped him up for 6 runs on 7 hits in only 3.2 innings. That's exactly the kind of early jump the Braves will need to take over these games, and it's something we as fans all love to see, because the Braves are 20th in the MLB in scoring for the first 4 innings. Striking first has also been a boon to our winning percentage, so we need to jump on Volquez quick. The CPA (31-20) won the Saturday pick, and didn't have a pick for the Sunday game due to travel. Tonight's matchup should be interesting if Teheran can continue to hold form from his last (almost no-hitter) start. The bats woke up on west coast time yesterday, and they've enjoyed a lot of success against Marquis in the past. Meanwhile Teheran couldn't be pitching better right now. You know he won't likely come out there with another shutout bid, but he's been progressively improving in his road starts, all he needs is the runs. It appears I have to scream at Dan Uggla, and call him completely worthless to get some sort of response. If so, I may just have to dog-cuss him in the blog for the rest of the year. Now, for those of you that remember, all I asked for in this 4 game set was a split. We got it on the back end, in the toughest way possible, but we got it so I'm happy. I'm also happy that the offense finally showed up in the 4th game. The 3rd game was a duel where we had to have our pitcher hit a homer just to get a win. Sad but true. Medlen was amazing in Game 3. He went 6.2 innings, 5 hits, no runs, and he hit a homer to right field that made the game 2-0. Dan Uggla provided the other bomb. That was the totality of the offense for the Braves. Literally, our 7 and 9 hitters had to be the difference makers. I'm shaking my head just thinking about it. The really frustrating part is that Simmons went 3-5 and was on base a ton. It's just that Heyward, Upton, Freeman, BMac, CJ, and even Dan went 0-8 with RISP in the game. It was a horrible hitting effort from the rest of the lineup besides Simmons, Dan, and Medlen, but then again horrible hitting was contagious through the first 3 games. If not for Medlen being lights out on the mound, and Kimbrel shutting a tight door in the 9th for the save, this game could have been in the hands of the Dodgers hottest young hitter Puig with the winning run on base. Luckily, it didn't happen. Medlen did enough though to earn his 3rd win and I believe the game MVP for his excellent pitching and game-winning hitting. Without him, that game was going to be a loss. Game 4 was a blood letting where the offense decided they had relaxed long enough. It never rains in Southern California, but we poured it on. Dan Uggla reached on every plate appearance with 4 RBIs (What? No way. But yes it's true! ), and Freeman did his usual ho-hum-I'm-awesome-let-me-clear-the-bases-loaded-on-a-double routine. Gattis, despite not getting a hit, also cashed in a sac-fly to left that plated another run. In an 8-1 victory, a lot of the run damage came from 4 guys, Heyward, Justin, Freddie, and Dan. The Braves went 3-7 with RISP (Magic number, finally), and Dan hit two bombs. Oh, and let's not forget Mike Minor. 6 innings of only one-run ball, with 6 hits, 3 walks, and 6 Ks. He was dealing with a lot of guys on base, including in the first inning when he loaded them with no outs, and Mike was able to wriggle off the hook with just one run. He's been nothing short of dazzling since his rough outings a year ago. So in a rare twist of fate, the Braves give up fewer total runs in the last three games than the did in the first game of the series, and they score more runs in the last game than they did in the first three combined. They are so all over the place on the road, I am just happy we can walk away from Chavez Ravine and over to the Petco Park with a .500 road record still intact. Also, don't look now, but your hottest 4 hitters over the last 7 days? Jason Heyward with .414, Simmons .324, Freeman .321, and Dan Uggla with .318. However, if you think I'm gonna let Dan off the look for a week's work? You're dead wrong. Until he crests the Mendoza line with RISP, he's got a lot of work left in my book. However, it has to start somewhere. Series preview for the Padres after lunch. These games have been awful. The Braves can't look much worse at the plate, since we've managed to score only the grand total of one freaking run in two games. There's plenty of blame to go around, but none of it should fall on Freddie Freeman. He's the only guy in the lineup who has consistently been producing hits. Dan Uggla came out of the woodwork for a rare 2 out RISP hit, the first one he's had since nobody can actually remember when. The main problem? Gattis had probably the worst game of his short career so far, Justin Upton got hosed on a 10th inning blown call by CB Bucknor (worst ump in existence), and the Braves went 1-6 with RISP. We're horrible right now in that category, and it's carried over from the Pirates series. While the hitting has been hideous, the pitching has been amazing. Paul added to another good starting performance going 7.1 innings with only one blemish, a homer to that rookie Puig. Didn't matter though, because he got only one run of support. If we're relying on our starters to throw shutouts on the road, we're going to lose a ton of games. The bullpen couldn't hold things together for long in extras, meaning the Dodgers got an easy "walkoff" when Varvaro heaved a wild pitch a foot in front of the plate, scoring a runner from third without the benefit of a hit. It was a horrible way to end an already horrible game. Is there really more I need to say? How can I break down exactly how pitiful this team can be once they hit the road? You'd think we'd be used to it by now, but the Braves seem to always find new ways to twist the knife, especially in late hours on the Eastern seaboard. We had one walk in the game, and it was Dan's. We had one run in the game, and it was Freddie coming around on a 2 out Dan single. The rest of the lineup besides Freddie and Dan combined for 4 hits, no walks, and a shameful display that stranded 8 runners. The CPA was right, we lost. I'm not sure what it will think of Game 3, but with a starter on the mound for the Dodgers that's never pitched 10 games, you have to hope the Braves can find something. Here's an idea, Fredi: Try that perfect lineup that scored 11 runs? Maybe leave the Mendoza show on the bench for a game and put in McCann again? The Braves luck has to turn as some point, and Fife is the kind of pitcher that got roughed by the Orioles (another high power team). Also Fife's unlikely to go longer than 6, which means we get at least 3 innings of Dodger pen if things go right. The odds are that leads to victory. That's what happens when you let a bad team hang around. The Braves had plenty of baserunners and plenty of chances, but they capitalized on none of them. In fact, they didn't just fail to make the most of their opportunities, in several cases they actively shot themselves in the foot with bad baserunning. Am I frustrated? Sure. It's never fun to stay up to watch a supremely boring pitchers duel when you know for a fact your lineup is better than theirs. It's frustrating to watch a starter who has struggled on the road look suddenly spot-on, only to get absolutely nothing in support. It's frustrating to watch a team make mental mistakes that cost them chances. That being said, it's one game in four, and I only want 2 wins to count this as a successful series. Treat it as a 3 gamer from this point forward, and go win 2 of 3. I'll open the analysis with the good news. Tim Hudson was fantastic. Those that were questioning him should go back into their holes. He made a mechanical adjustment a week back, and it's paying dividends on the mound. Things like that are what separates the good starters from the veteran Aces. Tim wasn't just going to rely on his stuff to get him out of a jam. He's constantly tinkering and tweaking things until they get right. Tim went 7 innings, 4 hits, no walks, and one run. Unfortunately that one run was enough. Some people will focus on the grand slam in the 8th, but I think if you had any run support at all, that doesn't happen. Tim was only at 76 pitches when he left the game after the 7th. The reason was that the Braves were down 1-0 and somebody had to pinch hit for Tim to get the Braves back in the game. If the game is tied (like it should have been at that point), Tim stays in the game and continues to shut down the Dodgers lineup. Who knows if we win, but I think the momentum would have swung in our direction. The failure for the lack of offense hangs on the back end of the order. They were not clutch. They were not able to get a timely hit, nor were they able to put the ball in play when needed. In the second inning with a runner on second and two outs, BJ took a walk to get to the pitcher. There are good walks and there are bad walks. That was a bad walk. It put the pitcher in a position to have to knock in a run, instead of BJ swinging the bat. A good walk is when nobody is on and you clear the pitcher in the order, not when you have a RISP chance. In the 5th, BJ took a good walk with 1 out, and Hudson promptly popped up a bunt to the pitcher for a double play. In the 7th, the Braves went first and third with nobody out. Dan Uggla couldn't make contact, Pena hit a hard liner that Freeman messed up the tag on (he would have been out anyway at the plate), and BJ flew out to right. Nada. In the 8th, Schafer got a leadoff single, then was involved in a bizarre double play where he got deeked by the middle infielders on a fly ball, and forgot to retag second base. It especially hurt since Heyward singled the next AB, which could have tied the game with the runner going. Note, Dan Uggla finally got a hit in the 9th when we were already down by 5, which was completely meaningless. He seems to only get hits in those situations, because he's hitting .105 with RISP. He has 75 Ks on the year in June, 3rd in the MLB. The Braves have 3 guys in the top 10 in Ks, Dan, Justin, and BJ. Dan's on pace for 200 strikeouts in a season. That would be top 10 in baseball history. EVER. I'm only placated by the thought that at around 150, Fredi probably benches him as an everyday guy. Dan's not only been useless in scoring position hits, but he's also got the 2nd worst glove at 2nd base in the majors. Throw in the huge money for no production, and it's a trifecta of crap. Just when you think you've over him being terrible, you get a fresh reminder. If it sounds like I'm hating on the guy, I am. He is going to go down in Braves history as one of the worst contracts of all time. He and Mike Hampton can hold hands in that Hall of Shame. The CPA (30-20) was wrong again because the Braves didn't score a run. Huddy held up his end of the bargain at least. What about game 2? This is an ugly matchup for the Braves. Maholm has been bad on the road, and the Dodgers lineup has a lot of experience hitting against the lefty. The high road ERA over 5.00 is a concern, but the biggest concern is the road WHIP of 1.41 by Paul. That's way too many runners to deal with in a game, and the Dodgers won't miss chances with their new boy Puig in the lineup. The other side is Ryu's 0.87 WHIP at home, meaning he likes to strangle out teams in his own yard. To win this game, the Braves will have to jump on Ryu early (something we've been terrible at), and also have Maholm get past the first 3 innings without getting touched up. Let's hope for a late night rally. For those that recall, the Braves split the season series with the Dodgers 3-3 last season. Those Dodgers were a much better 10 games above average team. This is an 8 games below average team, so I expect better results this go round. Game 1 features our struggling road ace against the Dodgers volatile starter who gave up 13 runs in his last 3 starts. Tim dazzled in Turner Field, but he's been less than stellar once he leaves the state. However, against the Dodgers Tim has held the lineup to under a .700 OPS, and specifically he's dominated Ethier, both Ellis boys, and Punto. The guys he struggles with are Adrian Gonzalez and Carl Crawford. The good news is that Crawford, Ellis, and Kemp are on the DL for the Dodgers, so they aren't a factor. On the other side, Greinke struggles with most of the Braves lineup. McCann, Uggla, and Justin have huge numbers off Zach, while Schafer and Reed, could also fit into the lineup with their successes off Greinke. I wouldn't mind seeing BJ take the day off in this matchup so Schafer can get a few ABs. Maholm has won 4 straight with 3 decisions, but he's another Braves guy with road troubles. Hyun-Jin Ryu lost to Atlanta in his Turner Field outing, but he didn't factor in the decision either. The Braves didn't hit well against Ryu, with the exception of Freeman and Heyward. Then again, they rarely hit pitchers well the first time they see them. Now that they have some looks, I expect better results. Maholm owns Gonzalez, but he struggles with Hairston and Ramirez. Seeing as how both of those guys are not hitting well this season due to injury or other reasons, I'm not really worried. The concern is Ryu's 1.57 home ERA versus Maholm's 5.36 road ERA. It's a different team that takes the field on the road, and odd things happen. Game 3 is one you hope Medlen will use as a building block. He finally got off the shnide in his last game, collecting the necessary run support to get a win. Not counting the game he was knocked out of with a random liner off the leg, Medlen has led the Braves to 3 straight wins when he's pitched 6 innings or more. Stephen Fife, who I want to call Barney, is getting his 3rd start of the season, and he's undefeated so far in the other two. Not good odds for young Kris as he's been snakebit before by guys the Braves have never faced. Medlen will have to watch out for Ramirez and Either with their combined .700 slugging against him, but the rest of the Dodgers haven't had much success. Fife destroyed the Padres in his only home outing, but the Braves aren't the Padres. Like, not even close. Game 4 is the marquee match for the Braves. Minor goes against Lilly in our favorite kind of lefty lefty matchup. The kind where we hold a huge statistical advantage. Minor is sporting the 2.52 ERA with a .90 WHIP, and Lilly has the 5.09 ERA with 1.61 WHIP. There's no part of this pitching matchup that doesn't favor Minor. Unless your name is Justin Upton, you don't mind facing Lilly either. The most ridiculous stat-padder is Dan Uggla with his 2 bombs in 13 ABs off Lilly. In a recurring theme of hitters to watch out for, Gonzalez has touched up Minor in his brief ABs against the young lefty. Basically if Adrian Gonzalez is in the box, the Braves need to be careful all series. That guy is one of the few guys on the Dodgers who can still damage you badly. He's absolutely raking this season at a .323 average with 20 extra base hits. In June. He's a top 20 hitter in the league right now, no questions asked. Avoid please. What's the one thing we remember about the Dodgers when they came to Turner Field this year? Did I hear crappy bullpen in the back? That's right! The Dodgers have the 21st ranked bullpen by ERA in the MLB, and the Braves are numero uno. If we knock out starters, it's all gravy from that point forward. That's why we swept the Dodgers in our home series in April. Now, it's a 4 game series on the road, so standard Ben the CPA expectations apply. I want a 2-2 split, and if I get more, good. However, no matter how bad a team is, I don't expect to come up with big numbers in a 4 gamer away. It's so hard to do in this league, and we've already lost 3 of 4 twice this season in road 4s. Just split and move on to the greener pastures Braves. That's what we need. The CPA (30-19) lost yesterday because it didn't predict a future that included Wandy Rodriguez leaving after 14 pitches. However, that's okay because the Braves won. That's when we're happy it's wrong by hook or by crook. Can Huddy rebound today? Let's see what it thinks. The CPA loves Huddy in a rebound game. He's good against most of the lineup for the Dodgers with the big boppers injured and on the DL. Greinke has been bleeding out in his last 3, and his mental state is bad enough before you even get to the shoddy pen. Look for the Braves to try and step on the gas early to make a statement. Watch for Justin Upton in this game, too. He loves hitting Greinke. Teheran pitched a gem yesterday, and came within 4 outs of the first no-hitter since Kent Mercker in 1994. As it was, the Pirates broke it up in the 8th with a pinch hit single by Inge, and Julio had to settle for a ho-hum 8 inning no-run effort. Yawn. I mean he walked two guys after all, and hit two guys. Plus he only struck out 11. I mean really Julio. We expect more. Oh you went first pitch strikes to 23/28 batters? I suppose that will do. The hitting in this series has been effectively awful. What do I mean by that? Well, the Braves had another day where they scored 5 runs, and went 0-9 with RISP, stranding 9 guys. In terms of timely hitting all series, the Braves only went 2-29 with RISP, yet they scored 17 runs. I have no idea how we pulled that off, other than a lot of bombs with guys standing on first base, and a lot of plays where people scored on outs or errors. So while the hitting has been effective, it's also been awful in efficiency. Sometimes you're not going to get 29 chances in a series. Sometimes you're only going to get 18-20, and you better take advantage of those chances against the better teams. Gattis and Laird went yard in the game, making a combo of back to back catcher power. Both homers were to left, and Gattis planted one way up in the terrace section at 426 feet. All of this was possible because Wandy Rodriguez left the game after 14 pitches with forearm tightness. If he stays in the game, who knows what happens? As it stands, the Pirates already beleaguered bullpen had to man the wall for an entire game. That almost never happens, and when it does you have to rely on your offense to bail you out. The problem for them was that Julio wasn't going to allow that, as he barely allowed any baserunners. The Pirates ended up using 5 pitchers in the game, and Bryan Morris did the yeoman's work for 3.2 innings after Wandy left the game. Morris didn't surrender a single hit either, so you had Julio and Bryan dueling each other for the first half. Part of the reason the game lasted less than 3 hours was due to that back and forth dominate pitching. I will give credit to the crowd for showing up for the day game in solid numbers, over 28k in total attendance. Those businessman's specials seem to have a good draw for people taking the day off before the brutal summer heat. I doubt we'd see that same number for a day game in late July. There were 3 errors in the game, all committed by Pirates. The Braves finally got a clean sheet after several games in a row of Benny Hill baseball. We needed to stop the bleeding in the field since we head to play a team like the Dodgers, because you can't afford to give bad teams hope. They will fold up and mentally leave the ballpark if you step on them early, but if you kick the ball around the infield and don't score until the 6th inning, that keeps a bunch of scrubs in the game. Preview of that 4 game series after lunch.